A while back, a good friend of the family gave us a small case of peaches. “What in the world am I going to do with all those peaches?” I thought to myself. I already had 2 big cans in my pantry just sitting there; surely I didn’t think I needed any more. 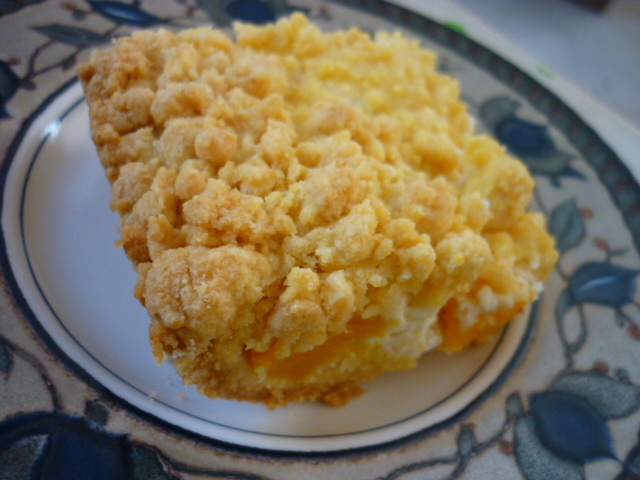 Of course I said, “thank-you,” and it wasn’t until about a week later that I came across this recipe for Peachy Keen Bars. 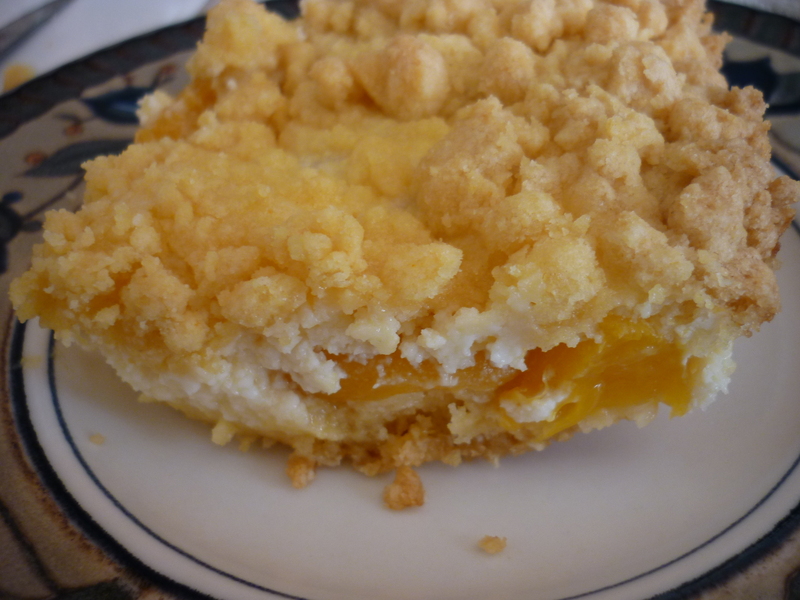 Now I’m hooked on canned peaches, and this dessert. It’s quick and very easy to make. I can’t wait to make it for our friend the next time he’s in town. 1. Preheat oven to 350 degrees. Spray a 9×13″ pan with nonstick cooking spray. 2. In a large bowl combine cake mix, butter and 1 egg; mix with fork just until crumbly. 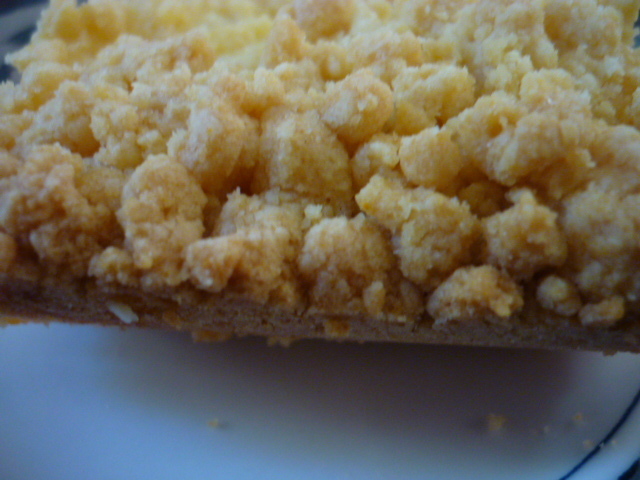 Set aside 1-1/2 cup crumbs for topping. 3. 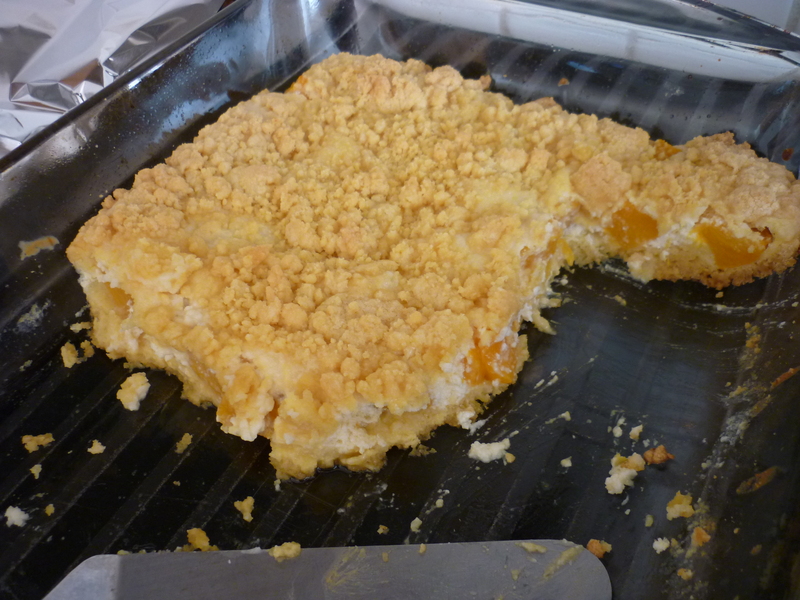 Press the remaining crumbs on bottom of prepared pan; Bake 10 minutes. 4. 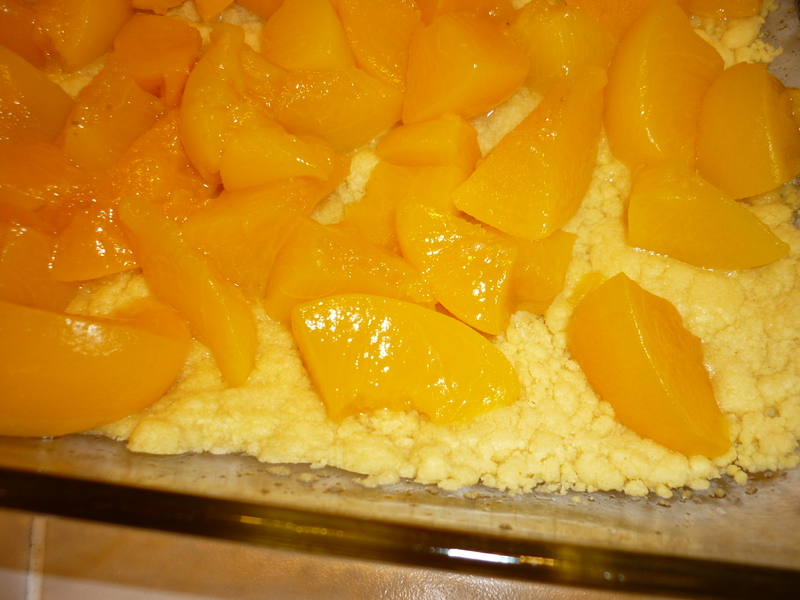 Cut peach slices into 1″ pieces; Spoon onto partially-baked crust. 5. In a large bowl, combine cream cheese, sugar, 1 egg and vanilla extract; beat with mixer until creamy. Spread over top of peaches. 6. Sprinkle with reserved crumbs; Bake 30 minutes. 7. Chill at least 30 minutes before serving. Serves 12. Store leftovers in refrigerator. What??!! 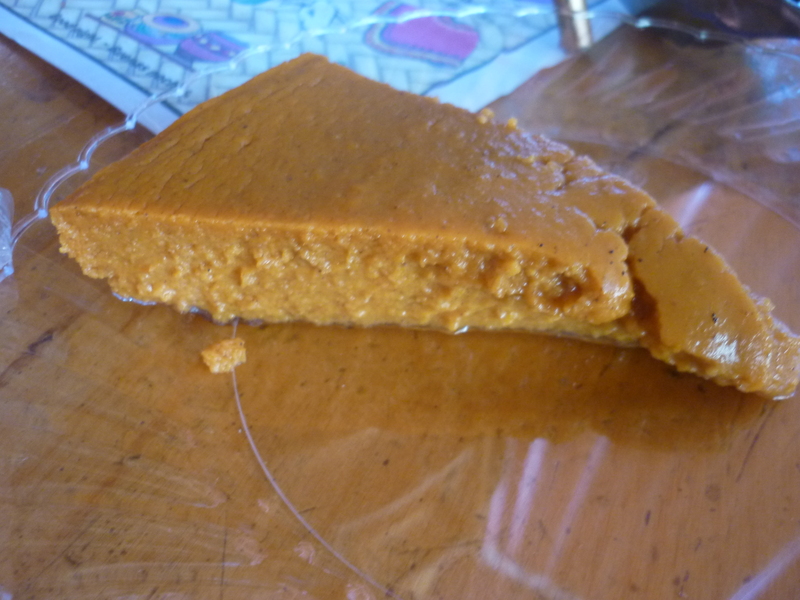 A pumpkin pie recipe post for March? That’s right! I’m such a rebel! All I’ve been seeing lately on Facebook and Pinterest is bunny cookies and grass cupcakes and here I am posting my humble crustless pumpkin pie. Hmmmm……with good reason. Read on. It was time for me to come up with a diabetic friendly recipe for ETR 2013. Being that it is such a challenge to find good diabetic desserts, I figured no one would raise an eyebrow when presented with this dessert. Who said there are rules about these things anyway, although I must admit, it would be odd to present Easter basket cupcakes in December. Ha! 1. Preheat oven to 350 F. Lightly grease an 8-inch springform pan. In a medium bowl, combine pumpkin, sugar, honey, and pie spice. Add eggs and vanilla. Beat lightly just until combined. Gradually stir in evaporated milk. Pour into prepared pan and place on a foil-lined baking sheet. 2. Bake for 45 to 50 minutes or until center appears set when gently shaken. Cool for 1 hour on a wire rack. Cover and chill for at least 2 hours or up to 24 hours before serving. 3. To serve, loosen pie from sides of pan by running a thin metal spatula around the edge. Remove sides of pan. Cut pie into wedges to serve. Makes 8 servings (1 slice each). 4. Choose from Splenda granular or Sweet’N Low bulk or packets. Follow package directions to use product amount equivalent to 1/3 cup sugar. Note: I actually had to double the recipe and used a 10-inch springform pan. I got a little happy and accidentally poured double the amount of evaporated milk. The result was a thick pie for a 10-inch springform pan.